The latest version of my Active Directory photo importing tool is now available, and yes it finally has command line support! Version 2.5 of AD Photo Edit is now available to download, both the free edition and standard edition have been updated (and the trial of the bulk edition is now up to date too). The majority of the enhancements in this release were requested by people using the application so thanks a lot to everyone that sent me feedback and suggestions. One of the most requested features for the bulk edition has been command line support, and I’m pleased to announce that this version finally has it. For now it only supports bulk imports but if you think command line support for bulk exports would be useful too then let me know. You can see the command line syntax and examples by going to Help –> Command Line Usage or by running the application with the /? argument. When editing an image for a single account, images are now automatically sized to fit preview panes. Set your own size limit for any images uploaded (individually or in bulk). Added the ability to cancel a search once it has started running. Once a bulk import has finished you now have the option to save the results to CSV file. Specify your own dimensions that images will be resized to when you click the Resize To Recommended Dimensions button in the Edit Image window. As always if there are any other features or enhancements you would like to see then feel free to send me an email or leave a comment here. Thanks 🙂 I’ll be honest I don’t think I’ll be developing any web based apps any time soon, or if I do they will be running on Silverlight rather than a regular web page. I tried recently to create an ASP.Net IIS app for this. Even from a user authenticated app with impersonation, it seems that ASP.Net does not have permission to write to AD. I have to admit that I didn’t have much time to spend on it, though. 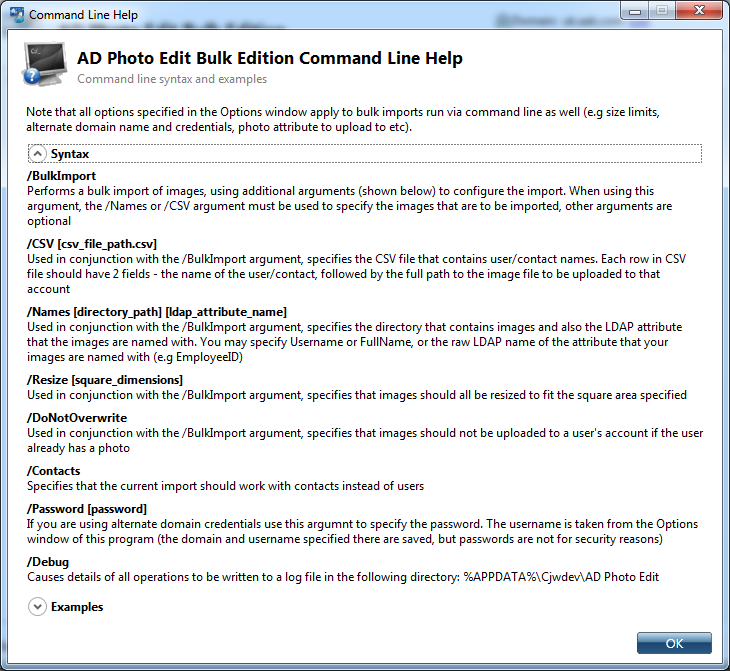 And since AD Photo Edit 2.5 now has CLI usage, it may be possible to just issue a suitable command from ASP.Net code. I can… but the idea is that you use a unique identifier (like the username) to name the images so that should never be an issue. What attribute are your images named with? It will work with any system where you can write to the same AD domain that Outlook is using, so yes it should work with Office 365 assuming you have the ability to update user accounts in the domain that Office 365 is setup to sync with or setup to use directly. I’m sure I’ve had other people using it with that successfully, but I’ve not tested it myself. I downloaded the free edition and it works great – also with Office365, so I just bought the Bulk Edition. Thanks for a great, easy to use product! I tried your free Bulk Trial version. I have a problem with my configuration. I have a Forest with one Root Domain and some Child Domain. I use Ipphone Ad Attribute to store name of the photo. When I use your tool in command line it seems to look only for users in Root directory even if ipphone attribute is in global catalog. Except this problem the tools is OK for me and I am ready to buy it. How can I use your tool in command line with a multi Domain Configuration ? Is there a way to indicate on command line on which domain we work ? the only way I see now is to go in Graphical interface but this is not very useful when you use batch. Just one more question, what happen if you import a photo who have not change since last import ? Does the photo import one more time and ad wll replicate this ‘change’ with other domain controller ? Unless you tick the option to not import photos for accounts that already have a photo then yes it will import it again. As for AD then replicating it again, I don’t actually know if it would be smart enough to realise the new value is the same as the previous value and not bother replicating it. If I had to guess I would say it would get replicated again even if it is the same. I think you’ve misunderstood what this program is for – it is for uploading photos into Active Directory, not for setting the user profile picture in Windows 7 or Windows 8. I use AD Photo Edit import uer photo to active directory, and i can use it on windows 7 acount picture and Exchange , but not work on Windows 8. I search soulution for windows 8. May bee have somebody have soulution for Windows 8 or you can write this feature 🙂 ? Set the value within named “AltDomainName” to whatever domain you want to work with. What about a BulkExport feature? We are mid migration and need a way to sync photos to all orgs in the midst of this migration. Yes you can do bulk exports in the bulk edition of AD Photo Edit – or are you specifically looking to do it via command line? So we are rolling out Exchange/Outlook/Lync 2013. I created a picture and added it to Lync manually. So I used your app to upload a different pic. I have domain admin rights. I uploaded the pic but all my products show the old picture. What am I missing? How to make this program work on Windows 8 64 bit. It doesn’t get installed at all. So where is the download button hiding? I’d like to eval. this for use here, but need something to eval. Can’t find anyplace that let’s you download.